Of all the hardships the lady spoke about and the pathetic condition of our country all you had to comment on was the spelling of a word? Ramesh AccessAbility is the name of the organization I run and not accessibility. Shivani, I felt really embarrassed and angry when I read this. I enjoy train travel just as much as you would have earlier and I had never once thought of how inhuman it could be for some to travel by train. However, as you pointed out in your usual calm way, it is not just the Railways. I would certainly like to share this article on our blog as well as other forums. I hope I have your permission to do that. Please do share it Gouthami. I would love it if you did. Hi, unfortunately your story is all too common in "developing / underdeveloped" countries. I am a quadraplegic and I work and live in Kenya and suffer the same challenges. We have laws in place which are just being effected and in the next couple of years I hope to see changes in regards to accessibility. However being the most affected it behoves us to create awareness and advocate for the changes we want to be effected. I am a Vietnamese student who is doing MA in Development Studies at International Institute of Social Studies (www.iss.nl) in the Netherlands and I am planning to conduct my research paper in India about young people (16 - 26) with physical disability and sexual rights. It is so great to read your blog and to know your work in India. I wonder if you know any NGOs that work with the disable so I can write to them because I am going to India for data collection in coming July and I will conduct about 10 qualitative interviews. Apologize if I bother you; however, do you have a contact with a sexual counselor mentioned previously? Thank you Judy for sharing your experience. Would love to meet you to someday. hello mam i'm also quardipledgic patient that suffers a lots of problems in day to day life nd nt able to go to other places due to the unavailability of recources..
We would be traveling with from Mumbai to Pune (using central railway) with two elder family members with various level of disabilities. We will compile various types of information and even take photos etc. to make their life comfortable. What would be the best way to share this information. We would be very happy to email or post it so others can use this info. M'am why dont you put up this article on a more public platform like facebook... The cause will garner way more attention... More peole will know of the hardships you faced and many others are facing for basic transportation needs of a common man.... And more importantly there is a greater chance of ther being a serious improveement in the situation if we could make it a revolution. Do try, M'am!! Recently I took a train off the Sarai Rohilla Station at Delhi. As I am a handicapped person, let me say I am overall disappointed by the kind of service existing there. First of all there was no arrangement of any wheel chair. I had to resort to luggage carryig cart to cross the platform. The coolie carried me towards the very end of the platform. The slope there was too sharp and there was no lighting there. Even the patch of road there was in a pathetic condition. Just to add that crossing over the tracks was quite risky and dangerous. Recently railways removed disabled couch at my location kakinada for gowthami express. I agree with you toilets are not clean and accessable. one more thing how many persons can travel by air like you. If your all relatives are allowed in the disabled couch. couch is very small how other disable persons can go to the toilet. If possible fight for the disable. Thank you for writing you rblog and what you are doing. My very honest and sincere appreciation for what you are doing. Hats off! can anyone help me please..? we are a group of non Indians travelling to India and disabled. do you know if we can access the fare concessions..for disabled people? if we can what is the procedure for accessing the concession? what paperwork do we need to bring along with us? and where / office do we go to obtain the concession? for availing of the concession you need to have a diability certificate issued by a government hospital certifying inter alia that you cannot travel unaccompanied. the form can be downloaded from the indian railway website. i dont know however whether foreigners are allowed to avail of the facility. 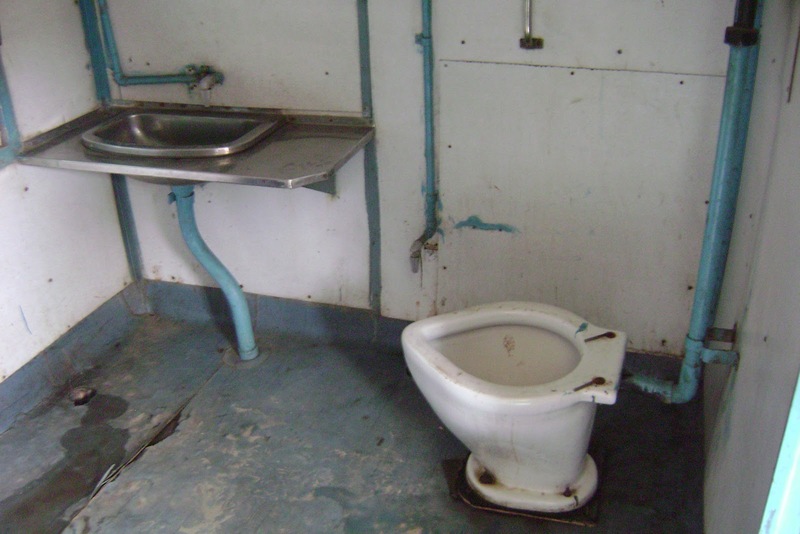 Thank you for sharing your Indian railway travel experience. You have explained very nicely of your travel. This article is very inspiring for us. 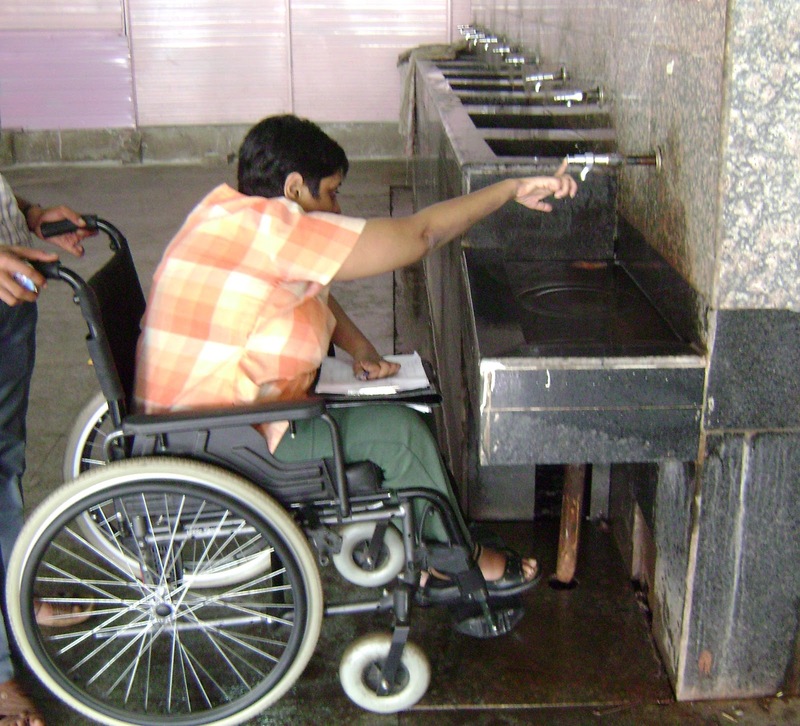 Ur experience is very crucial &this is the same situation with all the physically handicapped people. I am also physically handicapped and this is the same experience I face whenever I hv to travel by train. I is disheartening that even after 68 years of independence, we r not able to make our society fully inclusive and accessible for people like u and me. Thank you. This is a very interesting blog for me, as a design engineer. 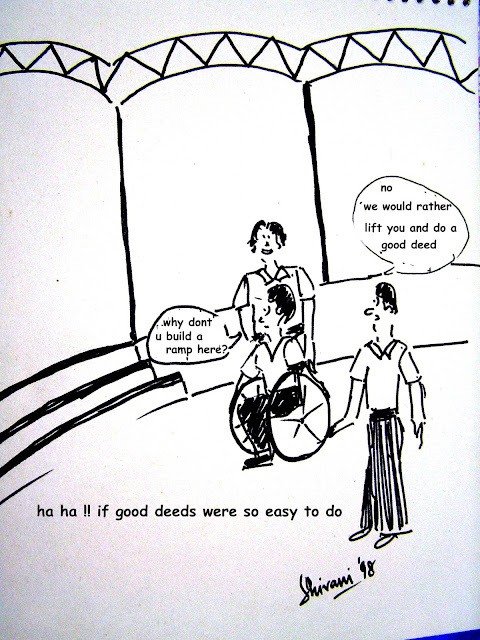 I do some pro bono work on public service designs for disabled citizens. I was part of the concept team for special coaches for disabled train passengers in 1996. My key take-away from your comments is that whatever services are offered, they should be consistent and reliable, as their users are restricted in their ability to do workarounds. The design needs a review, being 20 years old now. However, with due apologies, I cant help feeling that some expectations - not being segregated from other passengers while meeting special needs - could be mutually contradictory and not cost-effective. I havent yet seen a transportation system in the world (air, water, land) which does so - though all designers strive for this holy grail. I would be happy to hear more from you on your in-journey expectations (specifically trains & buses), so I can contribute my skills to better meet needs of mobility-challenged passengers. My current project is a design for a cost-effective (< 1 lakh) wheelchair for which requires minimal help to get into and out of, and that can be used for all daily activities, without need for a person by the side. Wish me luck, as I havent yet had a breakthrough in last 2 years. 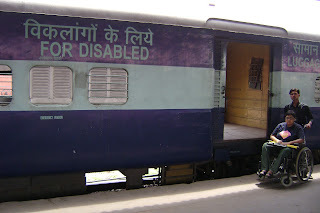 when the railways cannot ensure that reserved coaches are not invaded by passengers without reservation i do not see them keeping the disabled coach free of interlopers. secondly undertaking a journey with a disabled person requires a lot of preparation and no care giver is going to travel unreserved on the off chance that he might get adequate place for his charge. there are two issues which need to be resolved. the first is wheel chair access into the coach. would it be possible for stations maintaining wheel chairs to also keep a few portable ramps ? pictures of such ramps are available on the net. secondly the wheel chair itself should be narrower so that it can not only fit through the outer door but through the inner ac door as well. i use a transporter as distinct from a self operated wheel chair and it is just 22" across; thirdly the ac door itself can be cut at the bottom and rubber tubing / flaps put in so as to allow the wheels through without compromising the air conditioning. the other issue is the toilet one. since privacy is important for those using diapers or bed pans why not make the first cubicle in some of the 3 tier coaches enclosed as used be the case in the old 3 tier coaches for lady passengers ? a set of curtains for each berth as is available in the ac side berths would give even more privacy within the cubicle, so much for trains. at airports cannot one of the toilets be modified to enable a disabled person to lie down and be changed.? a curtained off space, a stretcher trolley of the type available in hospitals and a bin is all that is needed. Really, a thoughtful post. Indian railway system is one of the largest railway system in world. Also, click here to easily know about your train PNR status.